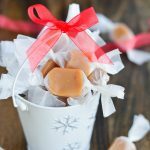 I partnered with SmartMade™ to create this post. Enjoy! 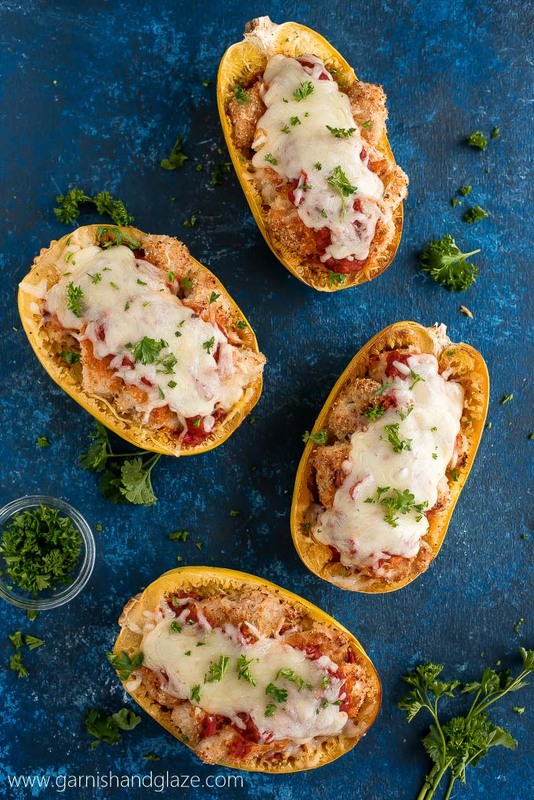 Make a smart swap and cook up some Baked Chicken Parmesan Spaghetti Squash for healthier dinner with the same great taste and crispy texture. Who’s still keeping up with their 2017 New Year’s resolutions? Have you been rockin it? Or have you let it slide? If you’ve gotten off track, it’s never too late to get back to it. DO NOT give up! 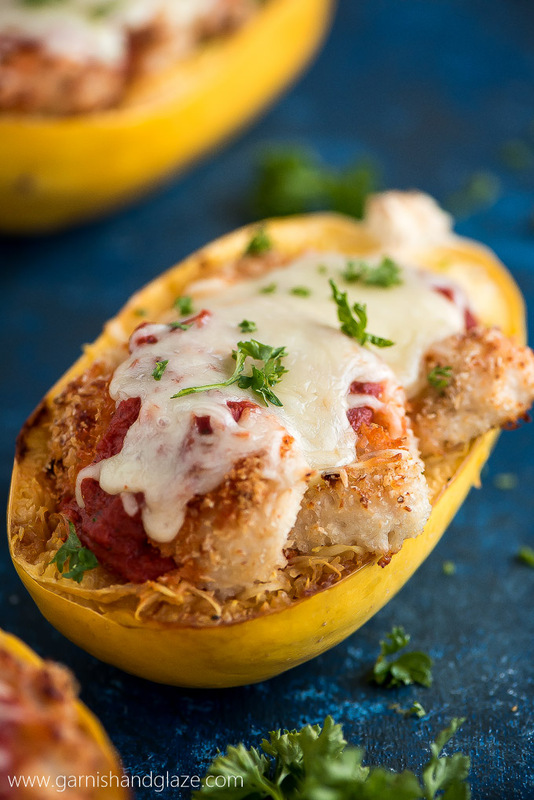 If your goal was to eat healthy, I’ve got a great recipe for you today– Baked Chicken Parmesan Spaghetti Squash. First off, typically chicken Parmesan is fried. Nope, not here! 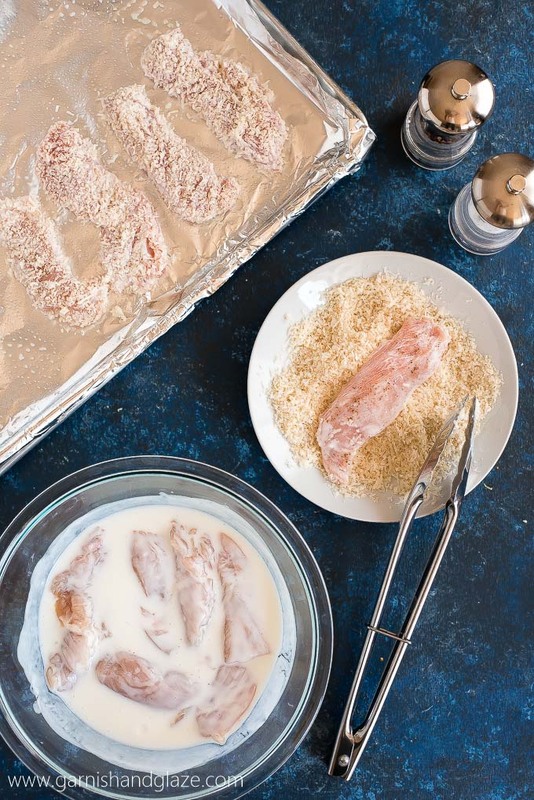 These little chicken strips are soaked in buttermilk and then coated in a mix of Parmesan and panko breadcrumbs. Same great crispiness with less grease! Second, chicken parm is usually served on/with pasta but I’ve swapped that for some yummy, healthy spaghetti squash. How cool is this vegetable?! So crazy that its fibers are in long strands like spaghetti! 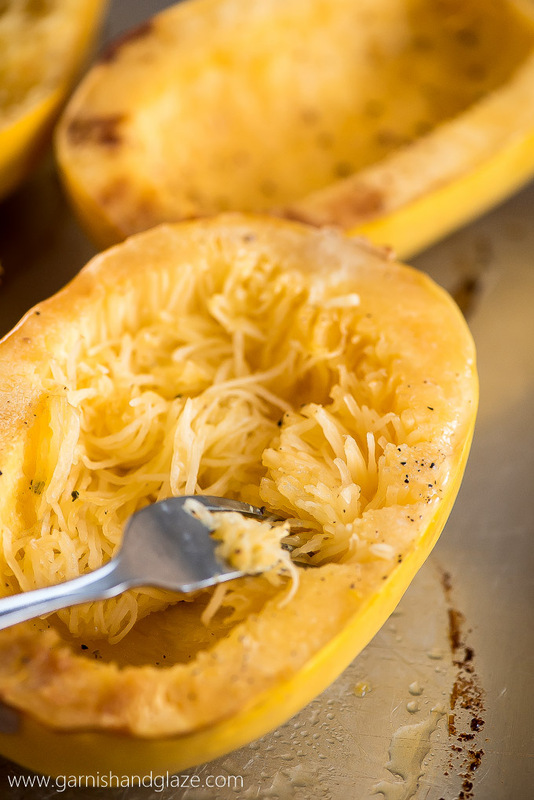 Have you ever swapped out spaghetti for squash? If you’re trying to eat a low-carb diet or consume less calories then make this swap in your next spaghetti recipe. 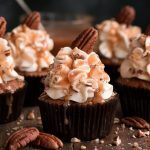 There are so many yummy recipes that are unfortunately not the healthiest for us. But a recipe is more of a guideline. Make a smart swap! You can swap out sour cream for Greek yogurt like I do in my Chicken Salad Pitas. Less fat/calories and tons of protein. Use whole wheat flour instead of white like in my No Knead, No Rise Pizza Dough. Some swaps are more noticeable than others but some you’ll hardly notice and won’t even miss. But maybe your life is super busy and hectic and you need a healthy meal fast. SmartMade is a new line of frozen meals that would be a great choice. It’s your favorite dishes but made with better ingredients to offer a balanced and delicious meal. They are meals that are inspired by the same healthy cooking techniques you already use like grilling chicken and roasting vegetables. It’s the perfect healthy meal for those busy days. Skip that frozen corn dog and chicken nuggets! Let me know what smart swaps you’ve been making or what you plan to. Be strong. Stay healthy. 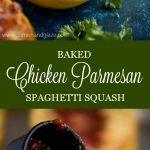 Make a smart swap and cook up some Baked Chicken Parmesan Spaghetti Squash for healthier dinner with the same great taste and crispy texture. Preheat oven to 375 and grease a baking sheet. Cut both squash in two, lengthwise. Brush with olive oil and season with salt and pepper. Remove from oven and let cool 5-10 minutes. Flip over and scrape the insides with a fork until it resembles spaghetti. Line a baking sheet with foil and grease. Combine chicken and buttermilk in a bowl and let it sit for 20 mintues. Season both sides of chicken with salt and pepper. Mix parmesan and panko together in a shallow dish. Dredge the chicken in the mix and then lay on pan. Bake at 400 F bake for 20 minutes, turn to broil and cook for 2-4 min until golden. 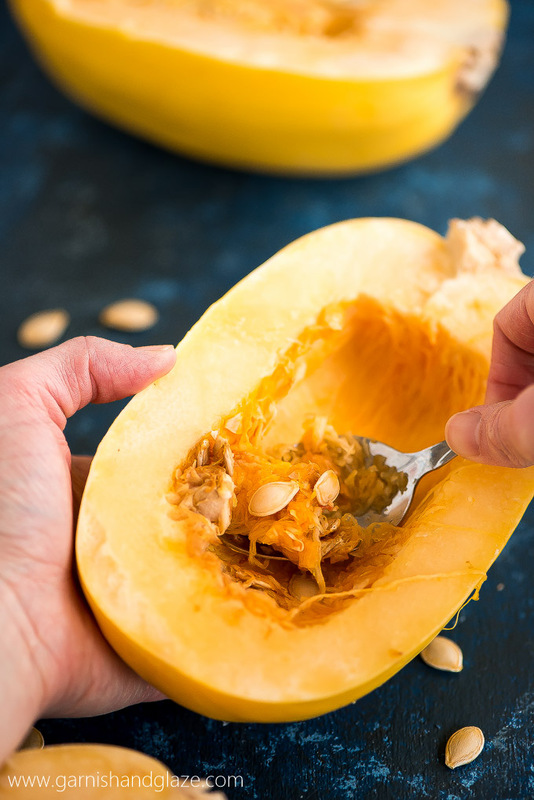 Pour 1/3 cup sauce on each spqghetti squash. Layer each with 3 chicken strips. Top chicken with remaining sauce and then sprinkle with cheese. Bake at 375 for 6-8 minutes or until cheese is melted. Sprinkle with fresh parsley and serve. 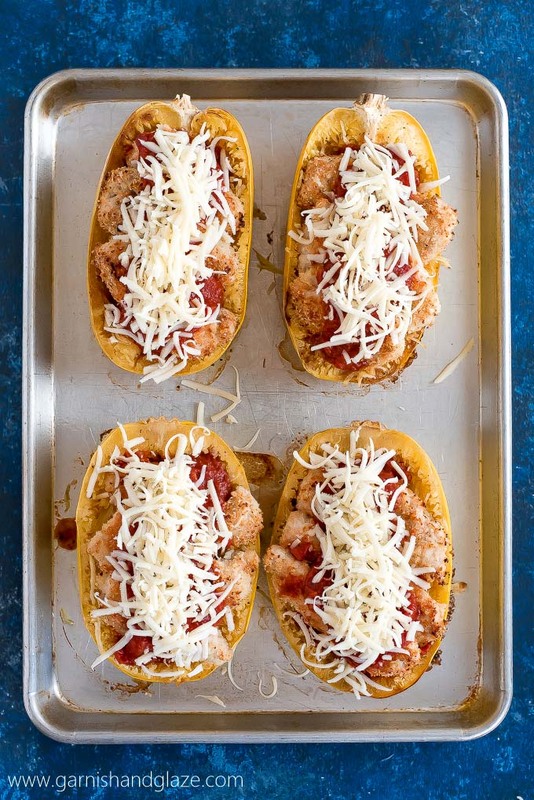 I bake my chicken parmesan instead of frying, but I’ve never tried it with spaghetti squash. Sounds delish! Thanks Kara! It’s delish! A great way to eat more veggies and cut calories and carbs. Such a smart swap idea! 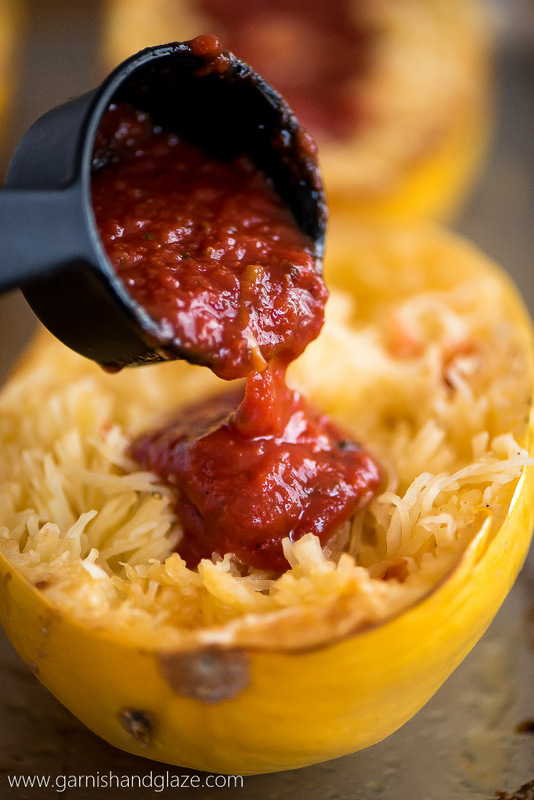 Plus, I think the spaghetti squash has way more flavor than pasta. Pinned! 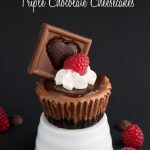 This looks so good – pinning to try later!! Trying this tonight! 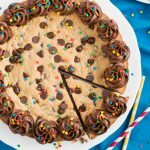 Sounds and looks delicious! Thanks!